Q: What is the difference between a chicken and a turkey? Q: What is a turkey’s favorite dessert? Q: Why should you never set the turkey next to the desert? A: Because he will gobble, gobble it up! It's the day before Thanksgiving, and the butcher is just locking up when a man begins pounding on the front door. "Please let me in," says the man desperately. "I forgot to buy a turkey, and my wife will kill me if I don't come home with one." "Okay," says the butcher. "Let me see what I have left." He goes into the freezer and discovers that there's only one scrawny turkey left. He brings it out to show the man. "That's one is too skinny. What else you got?" says the man. The butcher takes the bird back into the freezer and waits a few minutes and brings the same turkey back out to the man. "Oh, no," says the man, "That one doesn't look any better. You better give me both of them!" Q: What do you get if you cross a turkey with a ghost? Thanksgiving Dinner on the run. A woman called a phone number to find out how long it would take to roast her turkey. To answer the question, the Talk-Line home economist asked how much the bird weighed. The woman responded, "I don't know, it's still running around outside." Q: What do you get if you cross a pointy black hat and some leftover turkey? Q: Why did the turkey cross the road twice? Q: What does an English turkey say to another English turkey on Thanksgiving morning? A: To be or not to be roasted, that is the question. Q: Why do turkeys always go, "gobble, gobble"? Q: What sound does a space turkey make? 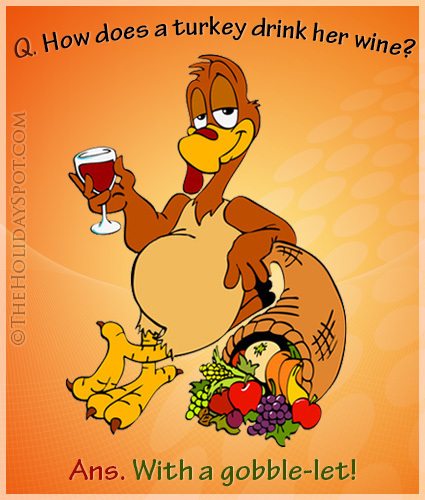 A: The turkey because he's already stuffed! Jimmy: Mmmmm! That turkey smells good and it's not even done yet. How long will it be? Mom: About the same length as it was before I put it into the oven, I suppose. Q: What sound does a turkey's phone make? Q: What's a turkey's favorite song? A: "I'm Dreaming of a White Christmas"
An industrious turkey farmer was always experimenting with breeding to perfect a better turkey. His family was fond of the leg portion for dinner and there were never enough legs for everyone. After many frustrating attempts, the farmer was relating the results of his efforts to his friends at the general store get together. "Well I finally did it! I bred a turkey that has 6 legs!" They all asked the farmer how it tasted. "I don’t know" said the farmer. "I never could catch the darn thing!" The pro football team had just finished their daily practice session when a large turkey came strutting onto the field. While the players gazed in amazement, the turkey walked up to the head coach and demanded a tryout. Everyone stared in silence as the turkey caught pass after pass and ran right through the defensive line. When the turkey returned to the sidelines, the coach shouted, "You're terrific!!! Sign up for the season, and I'll see to it that you get a huge bonus." "Forget the bonus," the turkey said, "All I want to know is, does the season go past Thanksgiving Day?" Q: Why did the turkey cross the road? A: To get to the other side. Q: Why don't you let a turkey get near corn? A: Because they will gobble, gobble, gobble it. Q: What do you call it when you drop a turkey from a helicopter? Q: In what country is Thanksgiving ironically not celebrated? Q: If you call a large turkey a gobbler what do you call a small one? Q: What's the best way to stuff a turkey? A: Serve him lots of pizza and ice cream! Q: Hear about the turkey that evaded the Indian? A: It had an arrow escape. Q: What did the turkey say to the turkey hunter? Q: Which side of the turkey has the most feathers? Q:Why did the turkey sit on the tomahawk? A lady was picking through the frozen turkeys at the grocery store, but couldn't find one fresh enough for her family. She asked the stock boy, "Don't you have fresh turkeys?" The stock boy answered, "But they are all dead. Now how can I make them take a bath?" Q: What did the mama turkey say to her naughty son? A: If your papa could see you now, he'd turn over in his gravy! Asked to write a composition entitled, "What I'm thankful for on Thanksgiving,"
little Timothy wrote, "I am thankful that I'm not a turkey." Have you finished off the first one? What happened to the other one? The other turkey is now reading our conversation, boss. If a man wants to eat a turkey on Thanksgiving, what does a turkey want? Ans- It simply wants to run away. What did the turkeys sing on Thanksgiving Day? Ans- God save the kin. What did the turkey say to the man who tried to shoot it? Ans- Liberty, Equality and Bad aim for all. What will a turkey with a dramatic bent of mind say to another turkey on Thanksgiving morning? Ans- To be or not to be roasted, that is the question. The pro football team had just finished their daily practice session when a large turkey came strutting onto the field. While the players gazed in amazement, the turkey walked up to the head coach and demanded a tryout. Everyone stared in silence as the turkey caught pass after pass and ran right through the defensive line. When the turkey returned to the sidelines, the coach shouted, "You're terrific!!! Sign up for the season, and I'll see to it that you get a huge bonus." "Forget the bonus," the turkey said, "All I want to know is, does the season go past Thanksgiving Day?" Q: What key has legs and can't open doors? Gobbler said, "Doctor, help me! I can't stop acting like a turkey!" "I see," said the doctor. "How long have you had this problem?" "Let me think a second. Mom laid the egg in 1954..."
A: It was the chicken's day off. Q: Why can't you take a turkey to church? A: Because they use such FOWL language. Q: What are the feathers on a turkey's wings called? Q: What's the best dance to do on Thanksgiving? Q: Can a turkey jump higher than the Empire State Building? A: Yes - a building can't jump at all. Q: What do you get when you cross a turkey with an octopus? A: Enough drumsticks for Thanksgiving. Q: How can you make a turkey float? A: You need 2 scoops of ice cream, some root beer, and a turkey. Q: Why did they let the turkey join the band? A: Because he had the drumsticks. Q: Why did the police arrest the turkey? A: They suspected it of fowl play. Q: What would you get if you crossed a turkey with an octopus?